This baked beans recipe is sponsored by Smithfield as part of their Bacon for Life Sweepstakes. 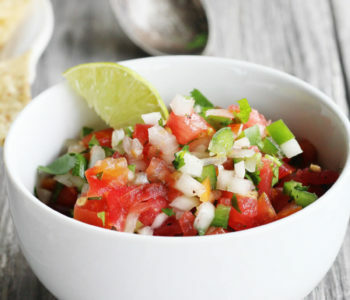 All recipes, ideas and opinions are my own. 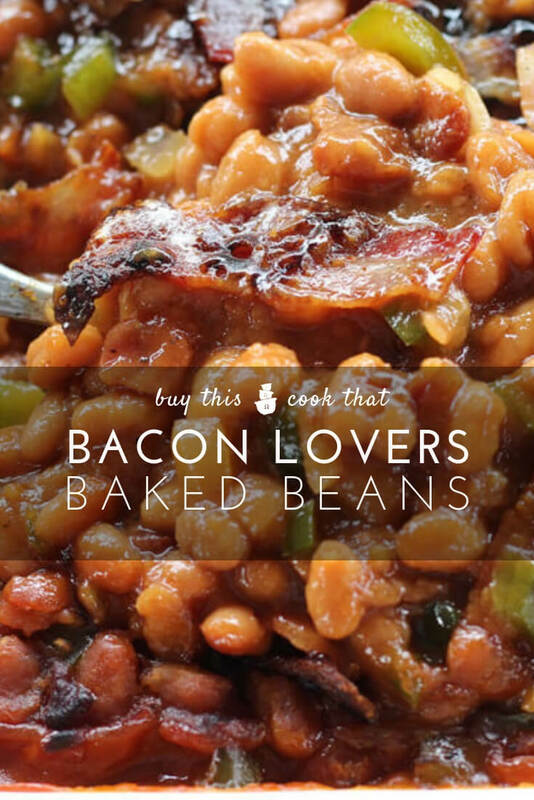 There’s baked beans, and then there’s this Bacon Lovers Baked Bean Recipe. We’ve loaded a delicious baked bean recipe with savory bits of crisp bacon and then topped the dish with more bacon. The beans in tangy-sweet sauce bubble up into the bacon. These are so good, and we can’t wait for you to try them. Plus, read about how you can win Bacon for Life. Baked beans are a go-to side dish at my house. 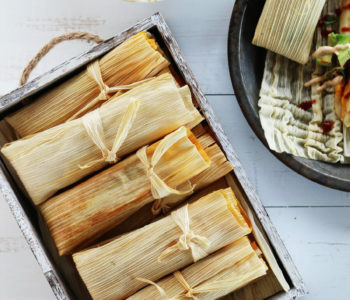 I love them served with hamburgers, barbecued chicken, and pulled pork. 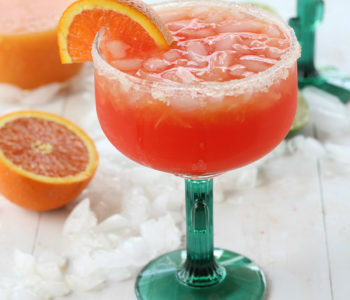 And of course, they are a must have at just about any family gathering or cook-out. 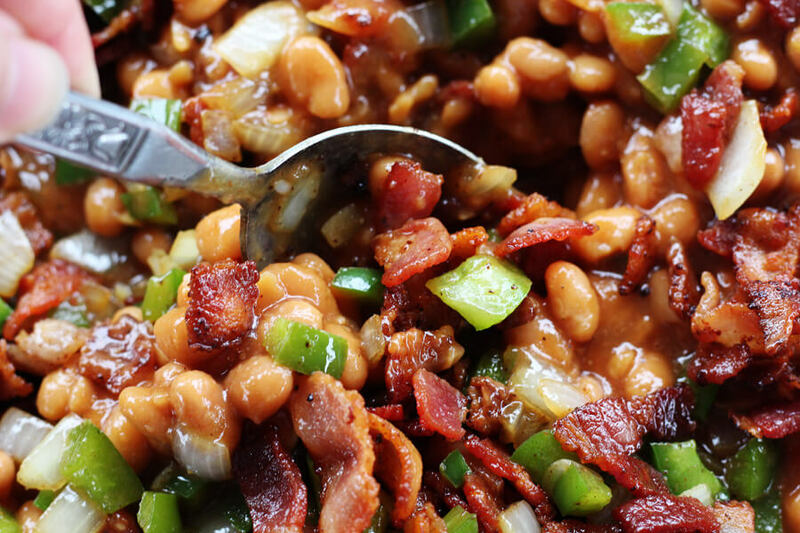 This EASY baked beans recipe is made more delicious with the addition of savory Smithfield Bacon. And I’m not talking about a little bit of bacon. I’m talking about a LOT of bacon. 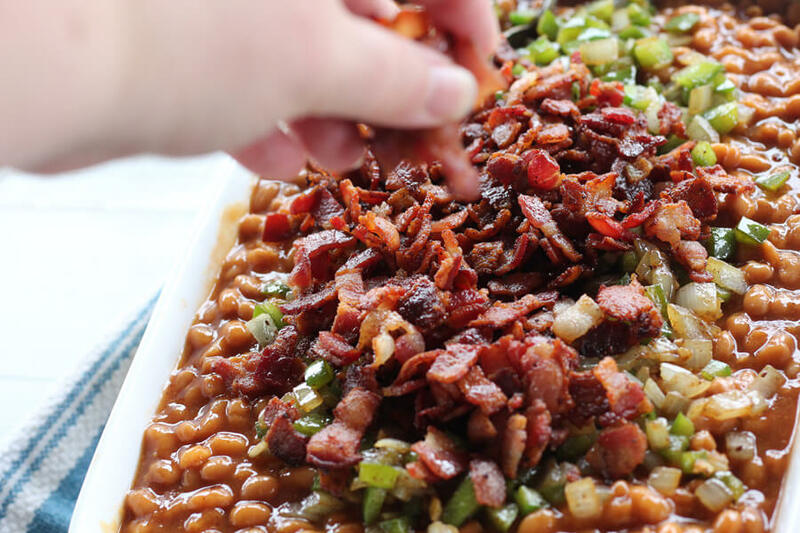 Every single bite of this baked beans recipe is packed with crisp, tasty bacon. Look for specially marked packages of Smithfield Bacon for a chance to Win Bacon for Life. Life. Bacon forever. What would you do with all that bacon? I know what I would do! Bacon for breakfast, bacon sprinkled doughnuts, bacon on my lunch sammies, bacon wrapped chicken for dinner and how about some caramel bacon cupcakes for dessert? With every pack of Smithfield Bacon you purchase, you can enter for a chance to win bacon for life. From September 1 through December 31, bacon lovers everywhere can look for specially marked packages in store. It’s simple! Bacon lovers everywhere can purchase specially marked packages of Smithfield Bacon at their local grocery store. A unique code will be included inside every pack sold; using this code, visit com/baconforlifeand follow the prompts to enter. The grand prize winner will win Smithfield Bacon for Life. There’s no gimmicks, no tricks… just a whole lot of bacon, for life and for the win. More than 1,000 runners-up will be awarded select bacon merchandise ranging from a bacon-centric bicycle and bacon-themed corn hole boards to bacon koozies and bacon catch-phrase glasses perfect for professing your bacon love. 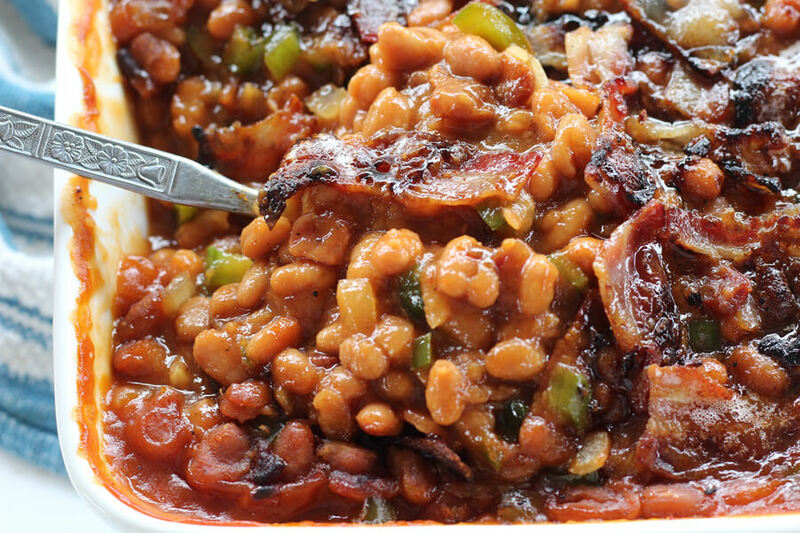 But back to the matter at hand…these delish bacon-packed beans. First, let’s take care of the bacon topping for the baked beans. I like to par cook the bacon that goes on top. Why? It makes sure it is well cooked and just the right amount of crisp. 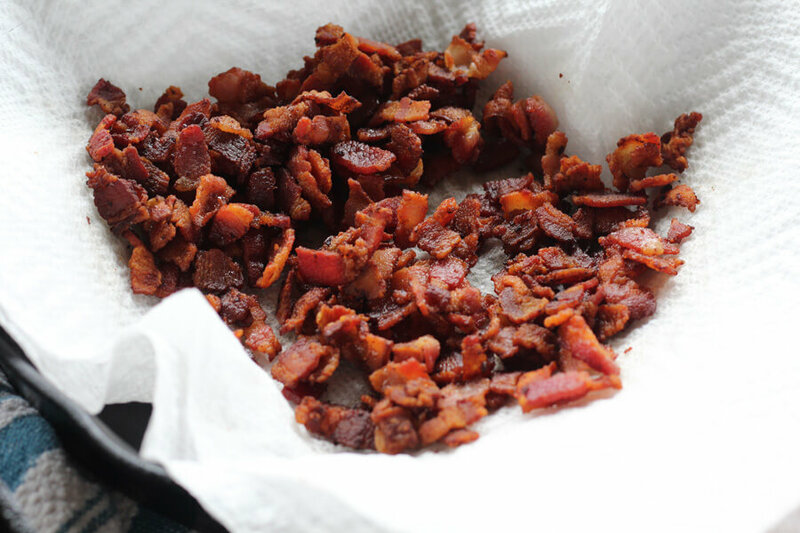 Arrange the bacon topping on a lightly-greased broiler pan and bake for about 20 – 25 minutes at 375 degrees. (Be sure to use a broiler pan with a catch tray.) 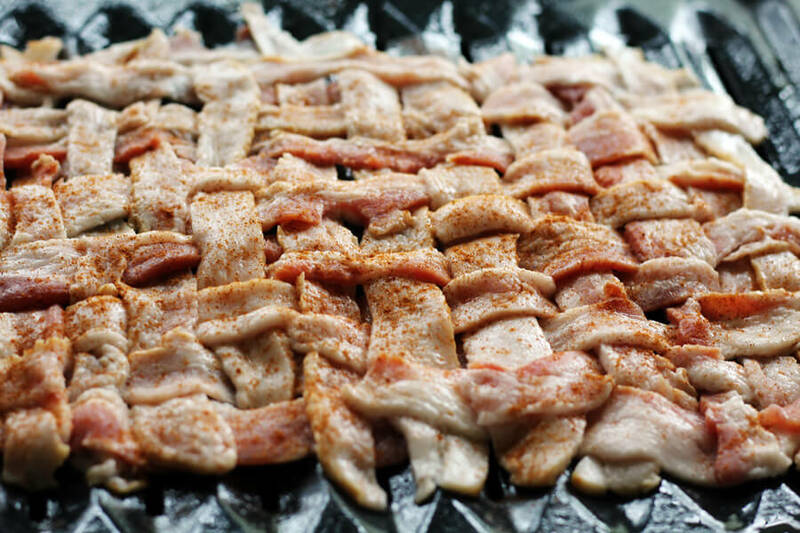 You can cook it in strips or have a little fun and make a bacon weave pattern. We cut our Smithfield Bacon strips in half lengthwise. NOTE: You want to use enough bacon to fit the top of the dish you are baking the beans in. Bacon will shrink when it cooks, so keep that in mind. To ensure our bacon fit over the top, we separated the weave to create spaces for the beans to bubble through. While the bacon topping is baking (and smelling heavenly) in the oven, cut 8 more slices of bacon into half inch sized pieces. Cook them until crisp and transfer to paper towels to drain. Work in batches so you don’t overcrowd the skillet. It is hard to resist snacking a little. Smithfield Bacon is so tasty. We used the Thick Cut variety. They also have Cherrywood and Hometown Original. 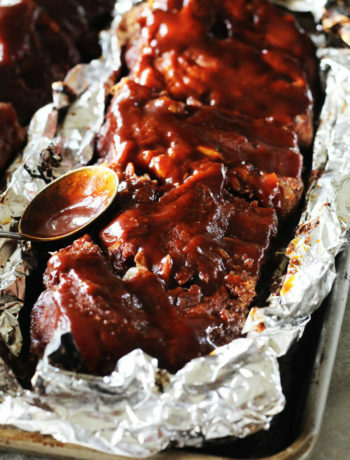 In a rectangular baking dish (8×12), stir together the drained pork and beans, brown sugar, barbecue sauce, and other seasonings. Get the complete ingredient amounts in the recipe at the end of this post. TIP: You can do this in a bowl if you’d like and then transfer it to the baking dish, but I just mix it all up in the pan. Why dirty up another dish when you don’t have to? Since this baked beans recipe contains so much bacon, there is no need to add additional salt. 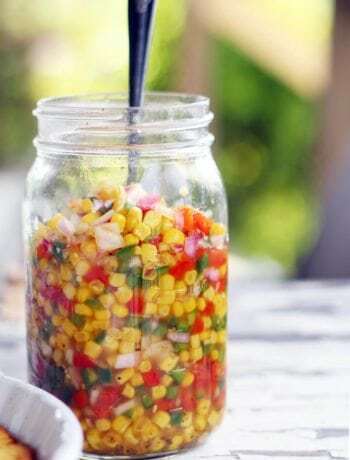 In some of the reserved bacon drippings, sauté the bell pepper, onion and garlic until soft. Don’t skip this step. 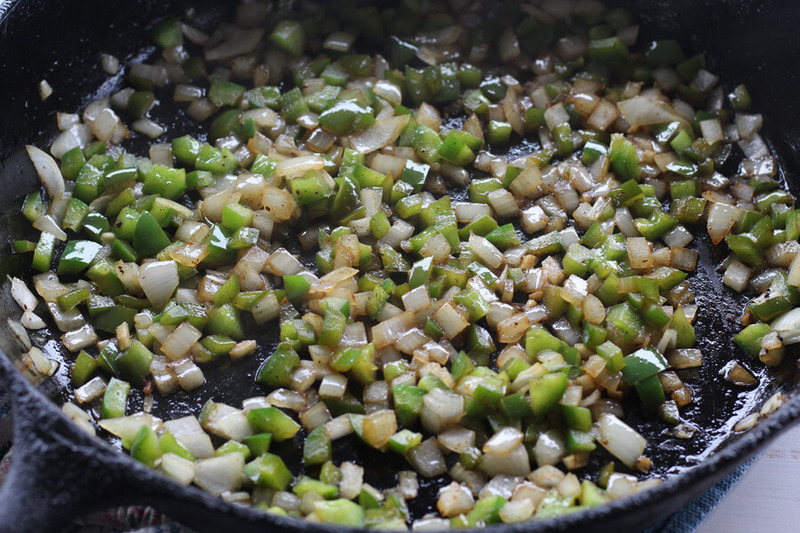 Cooking the peppers and onions adds delicious flavor to the baked beans recipe, plus the vegetables will be tender. Of course you have to have a Classic Southern Potato Salad recipe to go with these beans. Now it is time for Bacon Lovers Baked Beans to come together. Fold the prepared bacon crumbles and sautéed vegetables into the baked bean mixture. Stir until everything is well combined. Top with the par cooked bacon and then bake the dish uncovered for 30 to 45 minutes until everything is heated through and the baked beans are bubbly on top. Our baked beans recipe is so delicious! 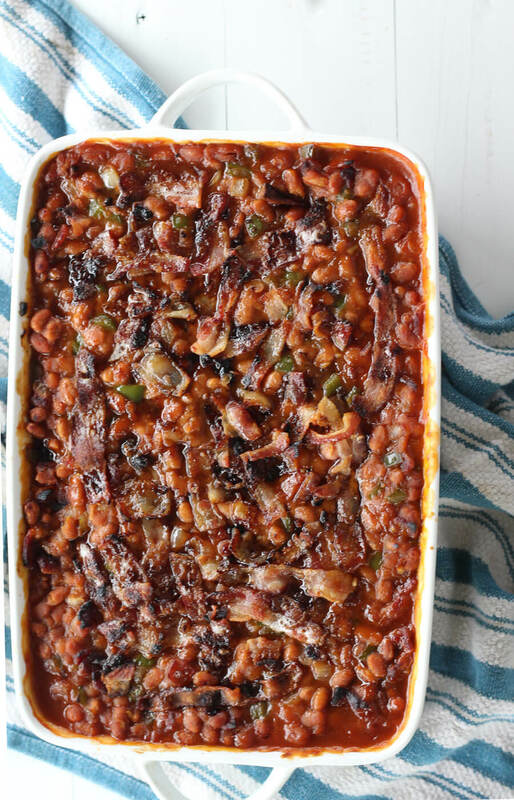 Hot and bubbly baked beans tangy sweet from the brown sugar and homemade sauce, layered with bites of caramelized onions, peppers and mouth-watering bacon. And topped with MORE bacon. 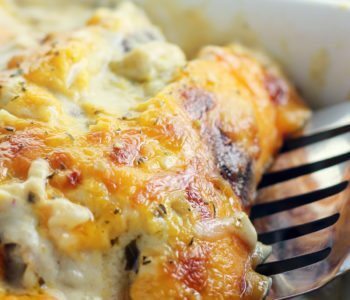 Do you have a bacon lover in your life that would love this recipe? Or are YOU the bacon lover? 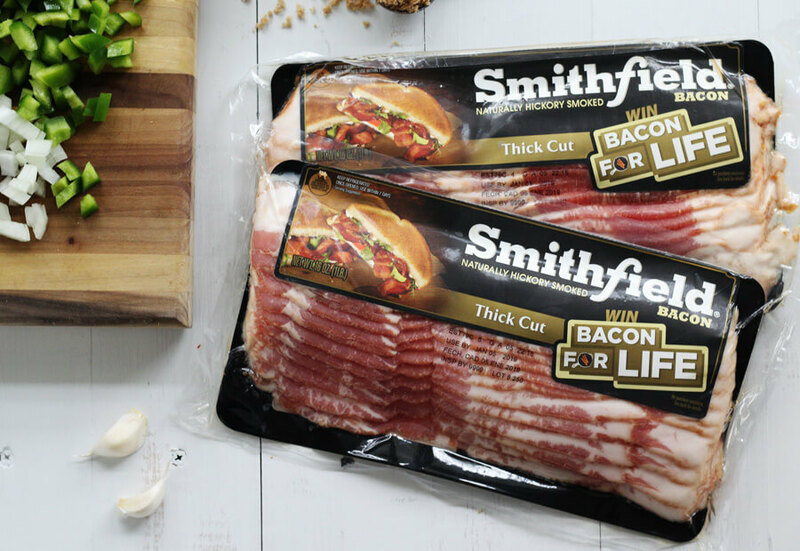 Don’t forget to enter to win Smithfield’s Bacon for Life Sweepstakes. 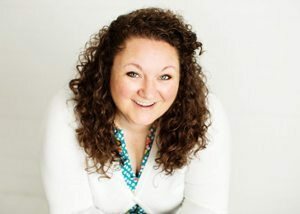 I was selected by Smithfield to participate in a campaign to promote their Bacon for Life Sweepstakes. This post was sponsored by Smithfield. 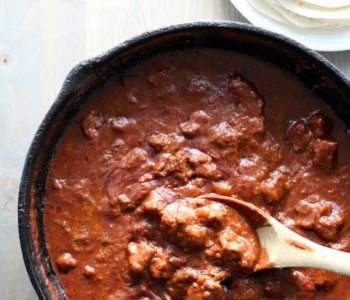 All recipes, ideas, and opinions are entirely my own. Bacon lovers rejoice! This homemade baked beans recipe is simmered in a tangy-sweet sauce and packed with savory crisp-bacon. Then it is topped off with a layer of smoky bacon and baked until bubbly. Preheat oven to 375 degrees. Arrange 8 strips of bacon as desired on a lightly greased broiler pan with a catch tray. Bake for 20 minutes. While the bacon is baking, cut the remaining 8 strips of bacon into half inch sized pieces. Brown the bacon in a large skillet over medium heat. 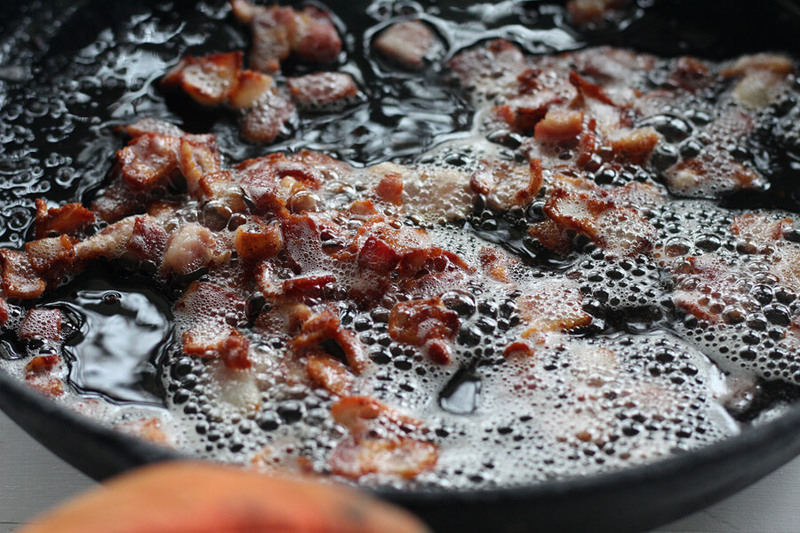 Work in batches and transfer the browned bacon to paper towels to drain. Reserve three tablespoons of the bacon drippings. 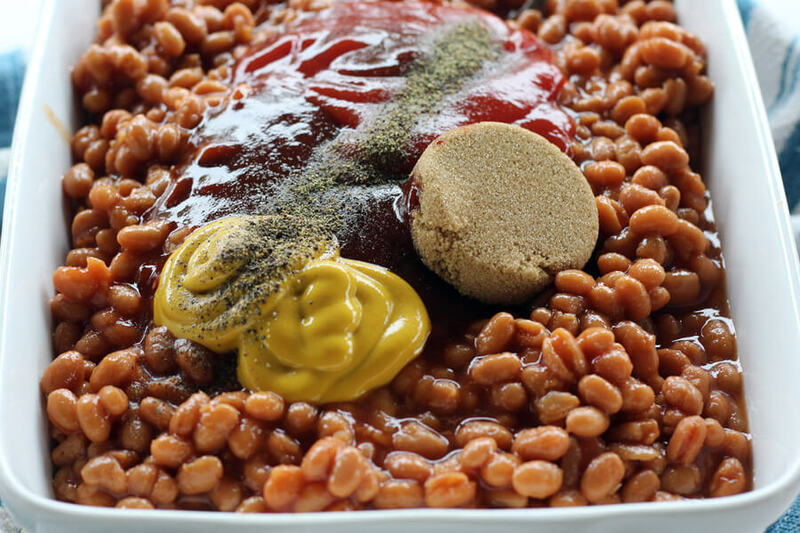 In an 8x12 baking dish, stir together the drained beans, barbecue sauce, ketchup, brown sugar, mustard, and black pepper. Saute the onion, bell pepper, and garlic in the reserved bacon drippings on medium low heat for 7 - 10 minutes until tender. Fold the prepared bacon bits and the sauteed onion and peppers into the bean mixture. Stir until well combined. Place the pre-cooked bacon strips on top of the bean mixture. Bake uncovered for 30 to 45 minutes until the beans are heated through and bubbly. 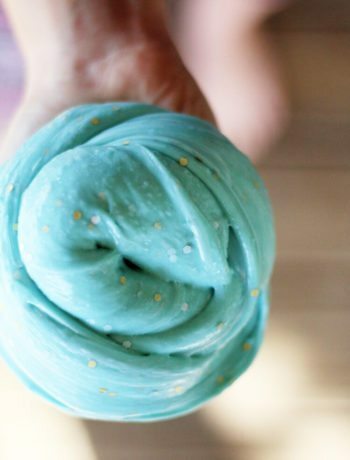 This recipe makes approximately 20 servings of 1/2 cup each.